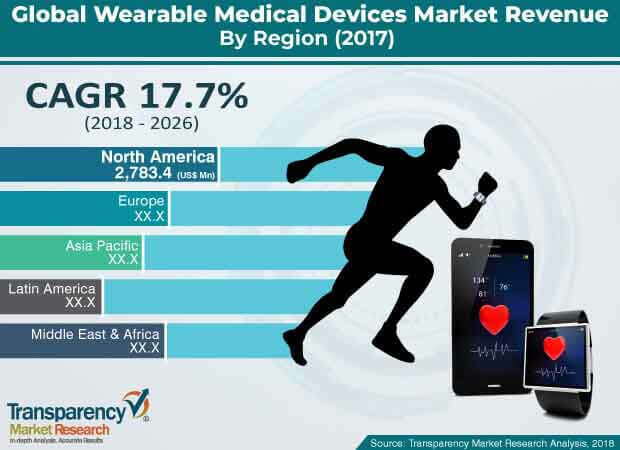 The global wearable medical devices market was valued at approximately US$ 6.8 Bn in 2017 and is anticipated to reach a value of approximately US$ 29.6 Bn by 2026, expanding at a CAGR of 17.7% from 2018 to 2026. The global wearable medical devices market is driven by the rise in prevalence of chronic pain, increase in diabetic population, increase in the geriatric population, and a surge in the rate of adoption of technologically advanced wearable medical products. Furthermore, a rise in patient awareness and healthcare expenditure and technological advancements are expected to drive the market during the forecast period. The global wearable medical devices market has been segmented based on device, product type, application, distribution channel, and region. In terms of device, the global market has been classified into diagnostic and monitoring devices and therapeutic devices. The diagnostic and monitoring devices segment has been further sub-segmented into vital signs monitoring devices, glucose monitoring devices, sleep monitoring devices, fetal monitoring & obstetric devices, and neuromonitoring devices. The therapeutic devices segment has been further sub-segmented into pain management devices, rehabilitation devices, insulin pumps, and respiratory therapy devices. Based on product type, the wearable medical devices market has been categorized into smart watches, activity monitors, patches, and smart clothing. The application segment has been bifurcated into sports & fitness, home healthcare, and remote patient monitoring. Based on distribution channel, the market has been classified into online channels, pharmacies, and hypermarkets. Based on region, the global market has been segmented into North America, Europe, Asia Pacific, Latin America, and Middle East & Africa. In terms of device, the diagnostic and monitoring devices segment is anticipated to dominate the global wearable medical devices market, owing to high usage of wearable medical devices for diagnosing medical health and fitness. Furthermore, increase in chronic diseases, such as cardiovascular and neurological disorders, is expected to drive the market during the forecast period. In terms of product type, the activity monitors segment dominated the market in 2017. It is expected to maintain its dominant position in the market during the forecast period. Based on application, the sports and fitness segment accounted for a prominent share of the market in 2017. It is expected to dominate the market during the forecast period. Increase in patient population, advancements in lifestyle, and improvement in health care infrastructure are expected to drive the segment during the forecast period. North America held a significant share of the global market in 2017. This is due to development of innovative products and increase in demand for products among the population. The U.S. held a major share of the market in North America as well as globally. The region is a major hub for innovation, where the world’s leading companies in the segment conduct research and development. According to the CDC, 29.1 million people in the U.S. have diabetes. Hence, demand for wearable glucose monitors, heart monitors, and activity monitors is rising constantly. Europe is a mature market for wearable medical devices. Therefore, the market in the region has been expanding at a sluggish pace due to a well-established network of major market players, which offers relatively fewer opportunities to new market entrants. However, a rise in the geriatric population and favorable health care reimbursement regulations are likely to drive the market in the region during the forecast period. Asia Pacific is an emerging market, offering significant potential. Expansion of the market in the region can be ascribed to the emergence of strong local manufacturers offering technologically advanced products at lower prices and increasing awareness among people about early diagnosis of chronic wounds. Major players operating in the global wearable medical devices market include Xiaomi Technology Co., Ltd, Samsung Electronics Co. Ltd., Fitbit, Inc., Garmin Corporation, Apple Inc., Huawei Technologies Co., Ltd., Polar Electro, OMRON Corporation, Activinsights Ltd., and VitalConnect. Increase in mergers & acquisitions, new product development, and strategic collaborations between major companies and governing authorities are expected to drive the global market during the forecast period. This report analyzes the current and future scenario of the global wearable medical devices market. Rise in prevalence of chronic pain, increase in diabetic population, rise in the geriatric population, surge in the rate of adoption of technologically advanced wearable medical products, and rise in patient awareness and health care expenditure are key factors that are projected to drive the global market during the forecast period. The global wearable medical devices market report comprises an elaborate executive summary, which includes a snapshot that provides information about various segments of the market. It also provides information and data analysis of the global market with respect to the segments based on device, product type, application, distribution channel, and region. A detailed qualitative analysis of drivers and restraints of the market and opportunities has been provided in the overview section. Additionally, the section comprises a competitive matrix and company profiles along with business overview to understand the competitive landscape in the market. This section of the report also provides market share analysis by key players, thereby presenting a thorough analysis of the overall competitive scenario in the global wearable medical devices market. The global wearable medical devices market has been segmented based on device, product type, application, distribution channel, and region. In terms of device, the global market has been classified into diagnostic and monitoring devices and therapeutic devices. The diagnostic and monitoring devices segment has been further sub-segmented into vital signs monitoring devices, glucose monitoring devices, sleep monitoring devices, fetal monitoring & obstetric devices, and neuromonitoring devices. The therapeutic devices segment has been further sub-segmented into pain management devices, rehabilitation devices, insulin pumps, and respiratory therapy devices. Based on product type, the wearable medical devices market has been categorized into smart watches, activity monitors, patches, and smart clothing. The application segment is bifurcated into sports & fitness, home healthcare, and remote patient monitoring. Based on distribution channel, the market has been classified into online channels, pharmacies, and hypermarkets. Based on region, the global market has been segmented into North America, Europe, Asia Pacific, Latin America, and Middle East & Africa. The market size and forecast for each of these segments have been provided for the period from 2017 to 2026, along with their respective CAGRs for the forecast period from 2018 to 2026, considering 2017 as the base year. In terms of region, the global wearable medical devices market has been segmented into North America (the U.S. and Canada), Europe (the U.K., Germany, France, Spain, Italy, and Rest of Europe), Asia Pacific (India, China, Japan, Australia & New Zealand, and Rest of Asia Pacific), Latin America (Brazil, Mexico, and Rest of Latin America), and Middle East & Africa (GCC Countries, South Africa, and rest of Middle East & Africa). The market size and forecast for each of these regions and the mentioned countries/sub-regions have been provided for the period from 2017 to 2026, along with their respective CAGRs for the forecast period from 2018 to 2026, considering 2017 as the base year. The research study also covers the competitive scenario in these regions. The report also profiles major players in the global wearable medical devices market based on various attributes such as company overview, financial overview, product portfolio, business strategies, and recent developments. The major players profiled in the market report include Xiaomi Technology Co., Ltd, Samsung Electronics Co. Ltd., Fitbit, Inc., Garmin Corporation, Apple Inc., Huawei Technologies Co., Ltd., Polar Electro, OMRON Corporation, Activinsights Ltd., and VitalConnect.